Are you interested in employment? Do you like to have fun? Are you outgoing and love to be the center of attention? Can you drive a 15 passenger bike bus with your feet, while singing cliche songs like “Don’t stop believing” in key and looking good while you do it? If you answer “Yes”, we want you to apply! The Social Station is Appleton’s first and only 16-passenger MegaCycle. Our party bike provides an innovative, eco-friendly transportation alternative for exploring the downtown area while socializing, enjoying the outdoors, sight-seeing, and staying fit. And, we’re hiring for summer and fall. As a tour guide for The Social Station, you will be responsible for taking up to 15 passengers on a 2-hour tour of downtown Appleton. You will also stop at 2-3 bars or local establishments along the way. During the tour, you will be in charge of driving on the pre-determined route and letting passengers off at stops on the tour. Customer safety is a top priority. Other duties include cleaning and maintaining equipment, moving the cycle pub in and out of storage, preparing guests for tours as well as answer any questions clients may have. On-boarding Customers- Loading coolers/riders, safety speech, etc. Driving- Responsible for steering, braking (no pedaling for drivers), time management. Customer Safety- Ensuring all customers follow safety rules throughout tour, removing passengers when necessary. Safety oriented- Our #1 priority is customer safety. This requires a confident and strong individual who can enforce rules when necessary. Extremely good communication and customer service skills. Its 100% about the customer and providing a fun yet positive experience. Passionate about the job and love what we do. We want tour guides who are equally enthusiastic. Reliable – In our business, showing up on time is being late. We’re looking for reliable drivers who are accountable and demonstrate good time management skills. Available to work nights and weekends. Life is short, join us for a pedaling adventure! The Social Station is a 4-wheel, 15-person MegaCycle. It’s the perfect party for pub crawls, special events, company outings, sightseeing tours, and so much more. We can make any occasion an epic celebration! We offer a unique and eco-friendly way to experience downtown Appleton while having fun with your friends and family. 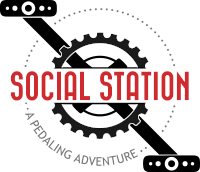 © 2019 Social Station Designed with by CairnTek in the Fox Valley.